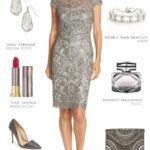 I’m going to take a short break from my usual wedding attire style posts, to talk about some gift-giving style instead. 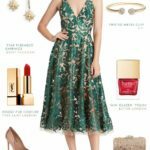 I like to find the perfect gifts almost as much as I like to find the perfect dresses but — like finding the right thing to wear– sometimes gift giving can be tricky. I really try my hardest to make my gifts useful and also personally suited the recipient, which is why some of my favorite gifts to give are practical and personalized gifts like these. Now, I’m not usually one for rushing the holidays, in fact, my house still has pumpkins outside, and I’m still trying to figure out plans for Thanksgiving dinner, but something about this blog forces me to shun my usual procrastination and look ahead and start posting now about holiday themes. 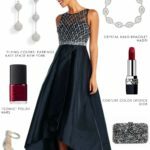 I hope it’s helpful those of your preparing for events ahead of time have some ideas. 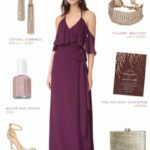 These gift ideas are really perfect for any time of year to give as wedding gifts, and there a few bridesmaid gifts are in here as well. If you want more ideas for your maids, check out this gift idea post too! 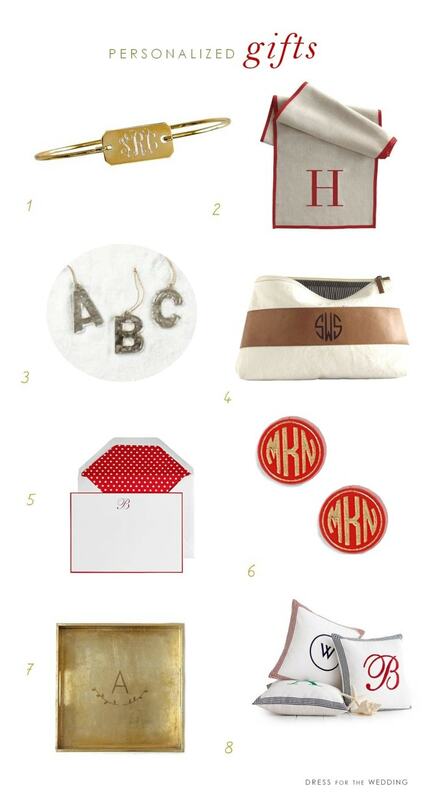 As you’ll see, I love a monogram or initial on nearly anything. I think it instantly says to the recipient, “This is just for you“, but it also says “Seriously, this is just for you — you cannot return or re-gift this,” so it’s a good idea to make sure your recipient will really love the gift, and that it’s not a redundant item in their home. With that note, here are some of the details behind my picks! Now we’re getting somewhere with true wedding gifts! 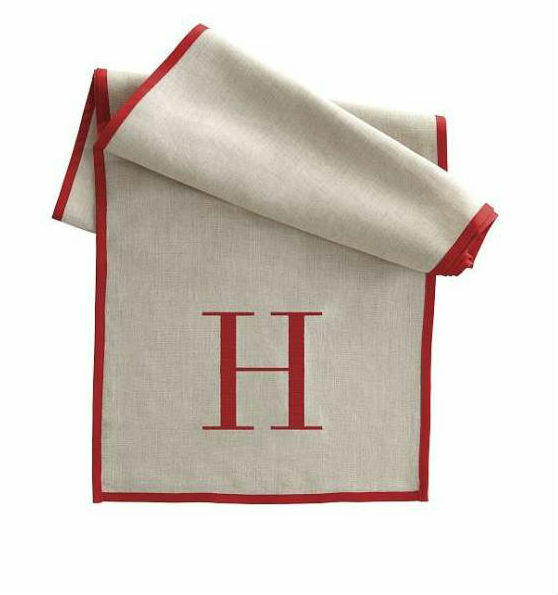 This jaunty little table runner is such a great piece. I never gave a much thought to table runners, until my mother-in-law gave me one, and now I use it every time I use the dining room table. Not only does it add texture to the table, it also adds a little more protection between hot dishes and the table — very handy when you have 5 toasty hot dishes for but only 2 trivets! ( I also use extra napkins as padding, too!) You definitely don’t want heat marks on your nice wood table. Here’s a gift idea that suits both wedding parties and newly married couples! For some couples, the first year of marriage means a new home and the first year of a new full-sized Christmas tree! It’s a bummer to have to go buy a ton of ornaments, and half the fun of ornaments are the memories of the time in your life when you first had that ornament or thinking of the person who gave it to you. Giving a set of these with the couple’s new initials is a fun thing for a housewarming gift or to put along with other registry gifts you might give at the wedding. My husband and I received Christmas ornaments as an engagement present from my cousins, and I think of them every year while I’m trimming the tree. This could also be a nice little add-on to other gifts gift for your wedding party if you’re having a holiday wedding. ( Tie the initial ornament like a gift tag on the outside of the present.) It could also be a fun decor idea for spelling out a celebratory message at a wedding, engagement party, or shower. For those of you not yet engaged, it could also be a good way to write out the proposal on a Christmas tree! Back to my love of monograms! Who can’t use another bag to store things in? 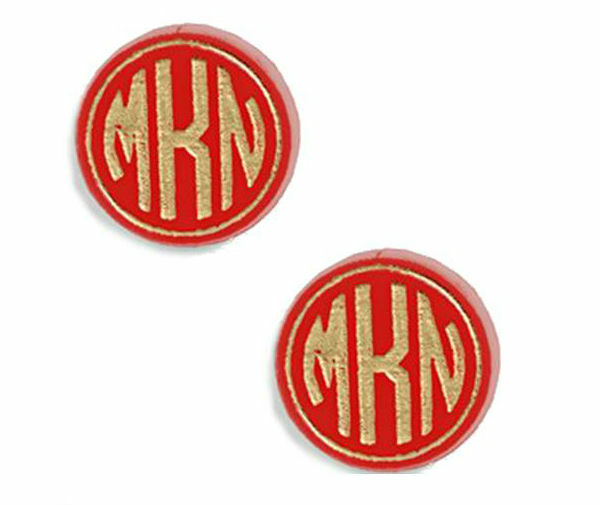 I know I use them all the time, and a monogram adds a lovely touch. Not only are these a fun idea for holiday giving, this would make a great bridesmaid gift, and the Dopp kit that is similar would be a great groomsmen gift as well! 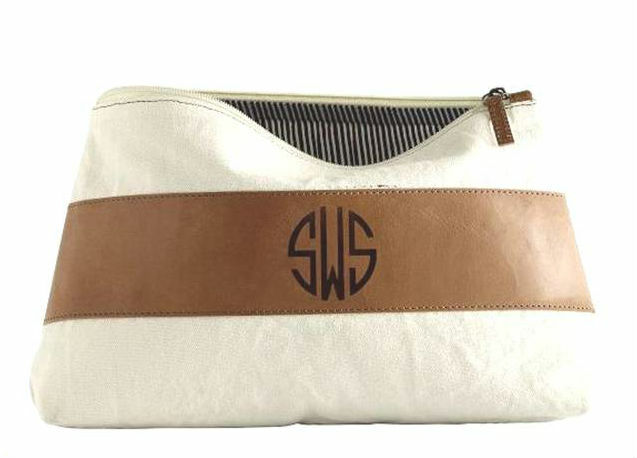 A makeup and Dopp travel set would also be a nice little shower gift for the couple who is always on the go! 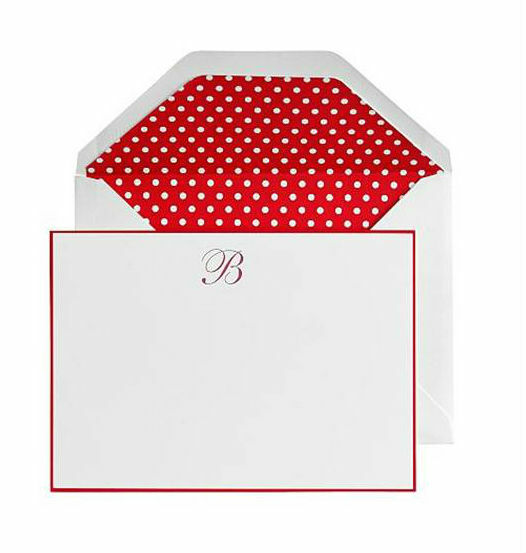 I love personalized stationery, but it’s often something I forget to purchase for myself. This image is of fancy custom letterpress stationery, that is heavy card stock and embossed. It’s a bit of an investment, but it would make a lovely gift for the new couple. 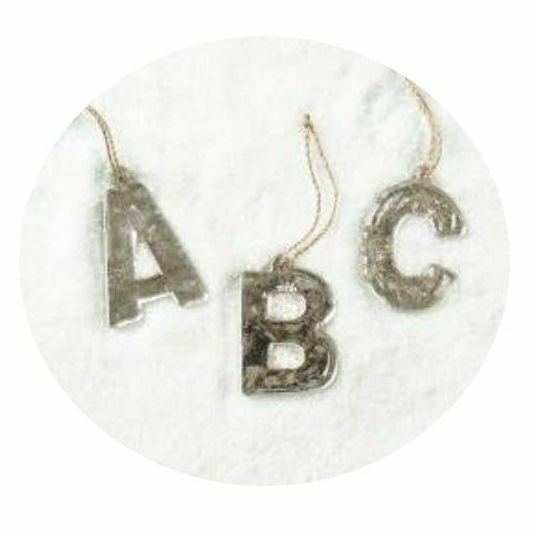 The second option is more appropriate for modest gift giving – it’s under $10, and comes printed with a simple initial. It would be a nice thing to put in to a stocking or a gift basket of shower gifts. These earrings might just be my favorite gift of the bunch! I first saw these from following The Perfect Palette ‘s style picks on Pinterest, and I’m such a fan too! These would be an amazing bridesmaid gift, and again, ahem, Mr. 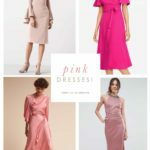 Dress for the Wedding, I think these are just lovely. I’m in favor of these earrings for anytime gift giving as well! 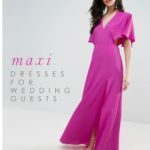 They come in pretty much every color and a few different fonts so you’ll have no trouble matching these to your wedding colors or finding them in a signature style that your bridesmaids will love. These are too cute for words! Have I talked about how the seemingly mundane things that you didn’t give a hoot about in college or when you lived with your parents suddenly become the things you love when you have your first house? Well, for me trays were no big deal until I had a house. ( Maybe the college dining hall made me rely on them?) I use them for everything: they can be a flat surface on a otherwise uneven ottoman or couch, a place to neatly store things that I use frequently on the kitchen counter-top or my desk, and they are great way to carry drinks and things from room to room without making a zillion trips when you’ve having a party. The best use of all is for a surprise breakfast in bed — that has to be one of the most wonderful luxuries ever! This one is so pretty with the golden look and the monogram, that I’d have it propped up like a functional work of art. These beachy pillows are right up my alley. 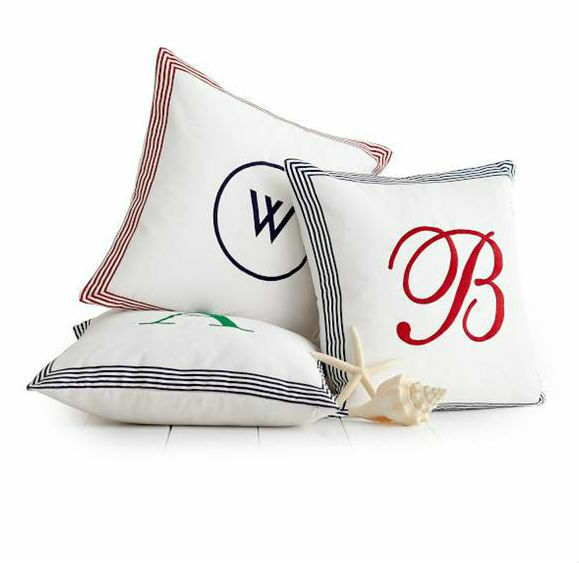 I love the stripey edges and the bold monograms, so if I ever have a beach house, I’m going to have pillows like this! I had picked these out for this post because I liked them and I realized yesterday that not only are they fantastic wedding, housewarming or holiday gifts, the are also great for wedding decor. This wedding on Borrowed and Bleu is full of personalized details and shows how pillows like this can be used as a neat touch at the seating at your wedding event, and then I’d use them after the big day pillows on the couch or bed. What a great keepsake! 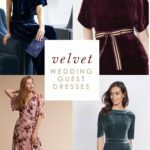 If this post doesn’t put you in the gift-giving spirit, well, you have several more weeks before that time is really here, but I’m hoping you’ve found it full of inspiration for little gifties for weddings, holidays and for friends and all the members of your wedding party. Haha! Love how you hinted to your husband for the perfect gift idea! 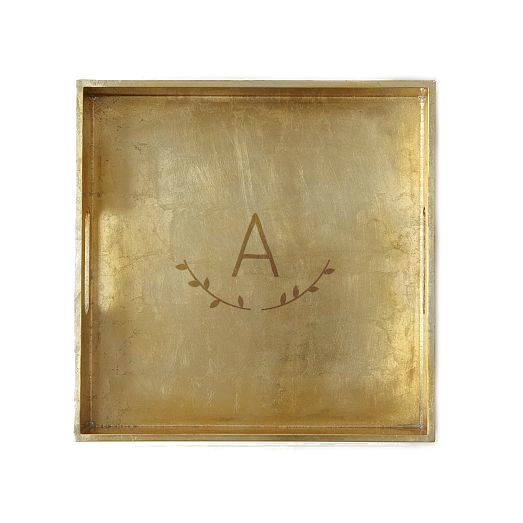 The gilded tray with initial is 100% my style, great roundup! I’d say yes to those pillows anyday! Personalization is such a nice touch! How fun! Happy Year Anniversary!! 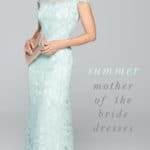 Yes, I think Mr. Maven Bride should definitely have a look :)!